Jacob and Swati's cross cultural wedding at Chunda Palace, Udaipur took our breaths away with all its ethereal beauty. Kudos to Weddings by Katia Peshanova for capturing brilliant candid and love-filled wedding moments. Look out for how dapper our groom looked in Indian ethnic wear! There’s some romantic magic to every wedding click taken at Chunda Palace! And this wedding shoot was no less charming. Love the cool blue colours against the pristine background! After a flying visit to Udaipur, the couple booked the whole of Chunda Palace for the duration of the wedding. They chose this venue because we could use any space we wanted in the whole palace, even the beautiful Jhoola room where the festivities of the Mehendi ceremony were started. It was a beautiful celebration with all the ladies singing and dancing Punjabi folk songs, keeping Swati company whilst she got my hands and feet painted with henna. After the ladies got their mehendi done, they started off the night with a frenzy of bholiyaans, an essential at a Punjabi wedding! The event was held in the main courtyard of the palace, which was completely lit up. The décor was colourful and vibrant, with cute Rajasthani umbrellas, dolls and a lot more. They had a Mela theme with live candy floss stalls, 'mehendi' cupcakes, live food stations serving chaats, pani puri and all the other street food India is famous for as they wanted their English guests to be able to enjoy the delights of Indian culture, especially the street delicacies. For the wedding ceremony, Swati wore a fishtailed lehenga custom-made in Delhi. She wanted something non-conventional so chose a deep purple over the usual reds and maroons. The lehenga, designed to her specifications was a unique combination of gold and silver threadwork, Swarovski embellishments and she chose to accessorize with a shimmery beige veil in net (like an English bride but with an Indian twist) with the same green and purple borders as the lehenga. She also wore a sparkling platinum and diamond set along with a simple crystal headpiece. Her better half Jake looked simply dapper, entering on a horse, pulling off a white and gold sherwani with a pink dupatta with ease. The reception that followed the wedding was an elegant as well as fun event to which Swati wore a beautiful beige, gold and black saree and Jake stuck to his roots by wearing a well-tailored 3-piece suit and a yellow tie. 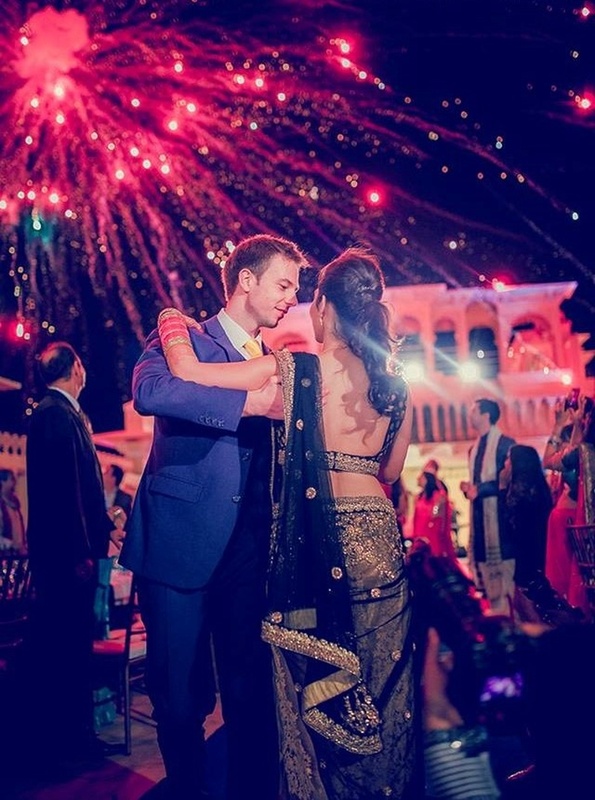 Fireworks, lanterns and pretty lights concluded this wedding affair.